United Launch Alliance, a joint venture of Boeing (NYSE: BA) and Lockheed Martin (NYSE: LMT), has been selected to provide launch services for NASA’s first mission to study the Trojan asteroids orbiting with Jupiter. ULA said Thursday it will deploy an Atlas V 401 rocket to send the Lucy spacecraft in October 2021 from Cape Canaveral Air Force Station in Florida. “Our Atlas V rocket has launched 79 times achieving 100 percent mission success, and we look forward to working again with our mission partners to explore our universe,” said ULA President and CEO Tory Bruno. NASA estimates that the Lucy mission will cost $148.3M, including the launch service and mission-related support. 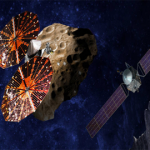 The agency selected Lockheed two years ago to design, build and operate the spacecraft during a 12-year journey to investigate seven asteroids around Jupiter.